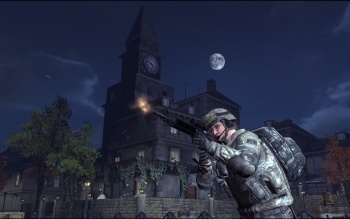 Since work began on free-to-play-FPS-slash-recruitment-tool America's Army in early 2000, the project has cost the actual US Armed Forces almost $33 million dollars over ten years. When the US Army first unveiled America's Army back in 2002, it had already been funding the project for a good two years. The game, which was half an uber-realistic free FPS and half recruitment tool, was originally announced as a five-year project with a budget of $7 million. Now, almost a decade after expenditures began, data obtained through a GameSpot Freedom of Information Act request has revealed that the game has turned into a 10-year project that has cost the US government $32.8 million dollars. The free-to-play game has received constant updates since its original 1.0 release in July 2002, the most recent of which was this year's America's Army 3 (in case you're wondering where America's Army 2 went, it was released as America's Army: Special Forces). While the game may have made back some of its budget thanks to the Ubisoft-published console titles America's Army: Rise of a Soldier and 2007's America's Army: True Soldiers, it's likely that the vast majority of the development costs have not been recouped. One also has to wonder where the money is currently being spent other than on server and bandwidth costs, as the team that developed America's Army 3 was let go a day after shipping the game. While there's no indication that America's Army has had much impact on army recruitment, it's hard to say it's had no impact at all - in early 2008, a young North Carolinian helped save the lives of victims in a traffic accident thanks to skills he'd learned in the game.